Breakfast, fair, conference and our booth. Today we had the first day of the CTIA Wireless I.T. 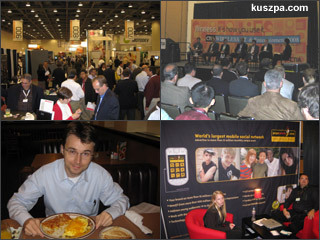 & Entertainment 2008, so after nutritious breakfast I was ready for the busy trade show. During the day I also visit a CTIA Session on Mobile Social Networks which was moderated by Rhonda Wickham (Wireless Week). It was informative event with presentations and discussions on the actual state of affairs on Mobile Social Media with participants like Nick Desai (Juice Wireless), Warren Faleiro (VeriSign), Mari Joller (Virgin Mobile USA), Nikolaos Papadopoulos (u-blox America), Paul Rehrig (Warner Music Group) and Nigel Rundstrom (Nokia).